Learning about time with toddlers and preschoolers might sound a bit challenging. Well, it’s hard even for a grade school kid! So many things related to time are there to understand and master: seconds, minutes, hours, days, the days of a week, months, future, past, present, etc. And all of these terms are connected with something that sounds so simple: time. It was already mentioned here on the blog how to assist kids with telling time and understanding time. Today we would like to talk about an easy way to use a clock with toddlers and preschoolers through play to assist them to grasp some of time related concepts in an easy and fun way. 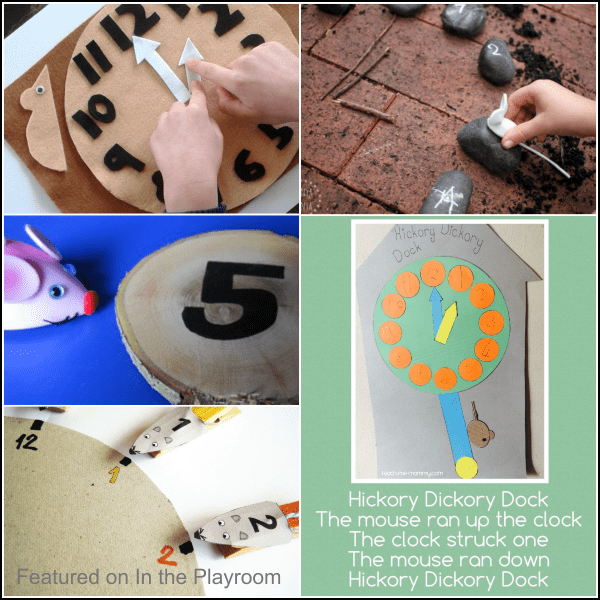 You are probably familiar with the nursery rhyme Hickory Dickory Dock? This little song is perfect as a way to teach children about time! Nursery rhymes in general are very simple and effective way to bring new concepts to younger children because they are repetitive, they are fun and kids love them! Bring the play outside! Gather some rocks, pick up some sticks, sing, play and learn about time! Find full instructions how to set up rock clock on Danya Banya. If you have a tuff spot, you can set up a wooden clock to tell time with your toddler as shown on Adventures of Adam. Sometimes you will prefer to use the clock as a quiet time activity and you can use felt board and felt clock set from MultiCraftingMummy. Add another dimension to a play! Along with learning numbers and telling time, use Hickory Dickory Dock rhyme to crafts with shapes like Teach Me Mommy. 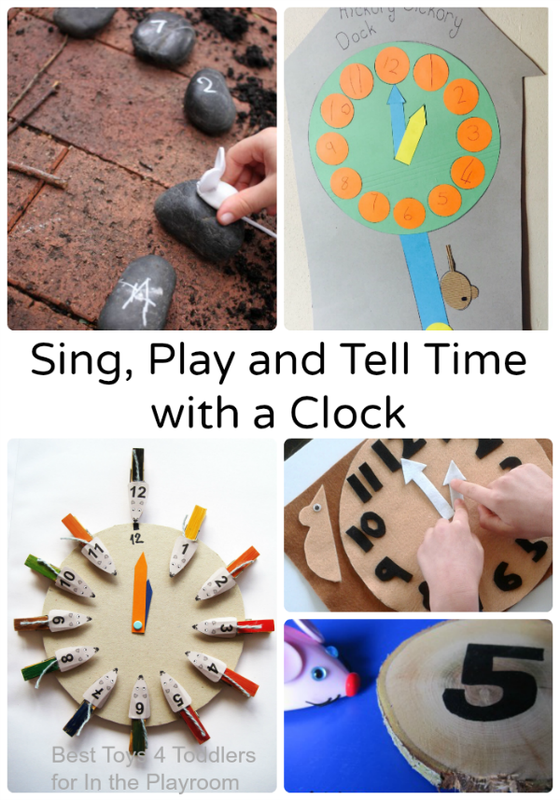 Another way to extend the play into learning is to use a clock with matching clothespins to reinforce fine motor skills while you sing along and chase the mouse around the clock! Now you have 5 easy learning activities to assist your toddlers and preschoolers to learn how to tell time and use clock! Which one you’ll try first? Mihaela runs Best Toys 4 Toddlers blog and loves to come up with new ideas how to use old toys her 2 daughters keep leaving on the floor to slip over. Right now she’s thinking how to get her 7 year old to make toys for 2 year old as an idea to bring them closer together. In mean time, you can find her on Facebook, Twitter and Pinterest sharing playful learning ideas for toddlers and preschoolers. Some great ideas – will be using some with Mouse!